Stereum hirsutum is a hardwood-loving crust fungus that develops fairly substantial, medium-sized cap structures that often fuse laterally with one another. It is smaller and more frequently fused than Stereum ostrea; it is larger than, and not as orange as Stereum complicatum. 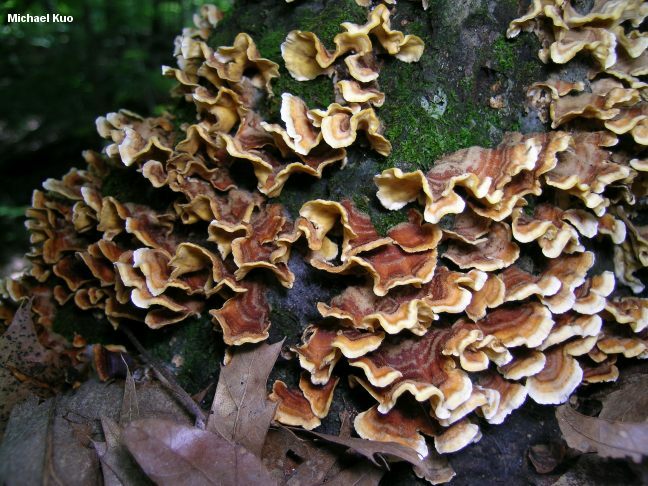 It does not "bleed" a red latex when injured, like several other Stereum species do. Under the microscope, it features "normal" hyphidia that are not adorned with projections or spikes. 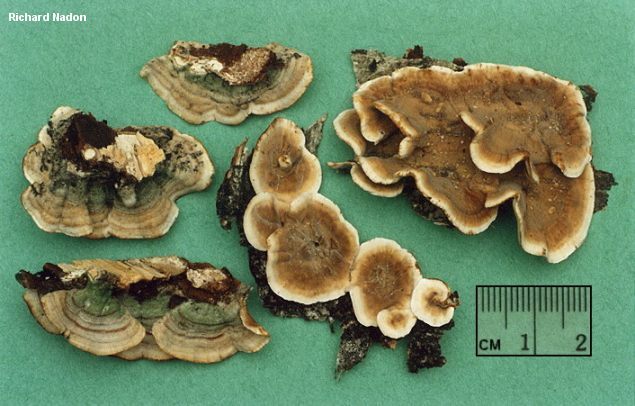 However, the name "Stereum hirsutum" is generally applied by mycologists to a group of species (or, perhaps, forms of a species) that tend to blend into one another; as one Stereum expert (Welden, 1971) writes, forms of Stereum hirsutum "are defined by external morphological features, and these are not dependable." Thus Stereum hirsutum, Stereum complicatum, and Stereum gausapatum, at a minimum, might best be seen as positions along a continuum, and would-be Stereum identifiers should probably be prepared for collections that don't quite settle themselves neatly into one or another position. Stereum complicatum, Stereum gausapatum, Stereum styracifluum, Stereum versicolor are all members of the Stereum hirsutum group, and are considered forms or varieties of Stereum hirsutum by some mycologists. Ecology: Saprobic on the dead wood of hardwoods, especially oaks; growing densely gregariously, often from gaps in the bark, fusing together laterally; causing a white rot of the heartwood; often serving as a host to algae; sometimes parasitized by jelly fungi; spring, summer, fall, and winter; widely distributed in North America. Fruiting Body: Individually .5-3 cm across, but often fused together; fan-shaped, semicircular, or irregular; densely velvety, hairy, or with appressed hairs; with concentric zones of texture and color; colors variable, but generally ranging from yellow to tan, brown, reddish brown, or buff (sometimes developing greenish shades in old age as a result of algae); laterally attached, without a stem. Undersurface: Smooth; yellowish to yellow-brown or grayish brown; sometimes bruising darker yellow. Chemical Reactions: KOH red (or at first red, then black) on all surfaces. Spore Print: White; difficult to obtain. Microscopic Features: Spores 5-8 x 2-3.5 µ; smooth; cylindric or narrowly elliptical; amyloid. Hyphidia with rounded to subacute apices; without projections (pseudoacanthohyphidia and acanthohyphidia absent). REFERENCES: (Willdenow, 1787) Persoon, 1800. (Fries, 1821; Saccardo, 1888; Welden, 1971; Chamuris, 1985; Arora, 1986; Lincoff, 1992; Horn, Kay & Abel, 1993; Barron, 1999; McNeil, 2006; Binion et al., 2008.) Herb. Kuo 09210503.